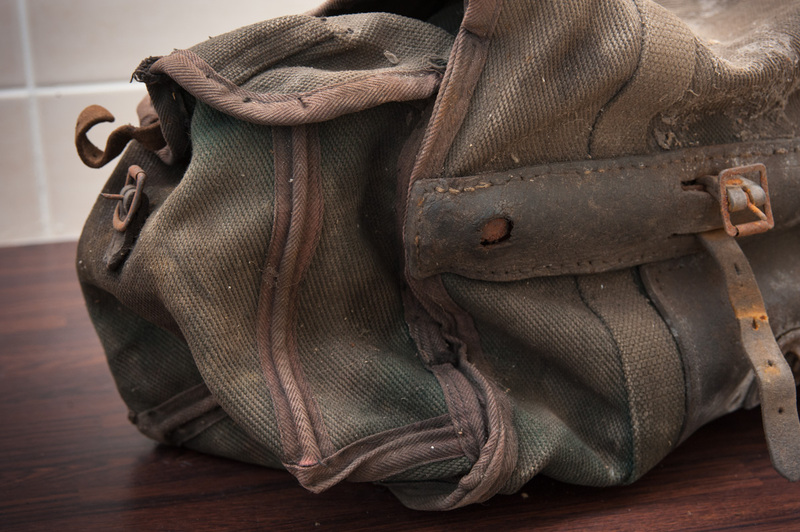 the buckles are the eyes and the leather reinforcement underneath is the frog-like mouth. Just over a year ago, I wrote about a barn find bicycle that I eventually got my hands on having been pursuing it for quite a few years. It's a 1948 Hobbs of Barbican that had been mouldering away at the back of a shed belonging to an ex-cyclist now in his 90s. It was in a bit of a state when I got it as you can see if you visit the barn find post. It's in much better condition now but in bits as I took it apart to clean everything and haven't got round to putting it all together again. I'll probably wait until we've sold our house and are settled somewhere else. We had a couple coming to view our home the other day so I'd decided to give the garage a good clean out and tidy. 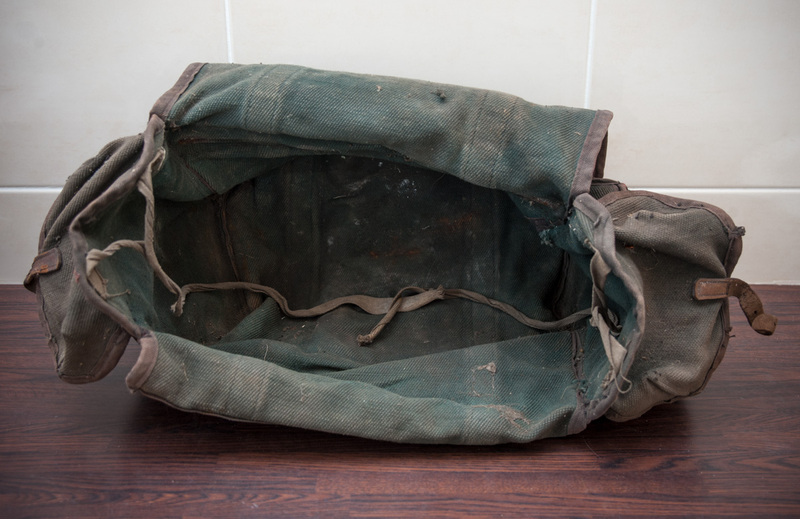 In the process, I came across this old bag that I'd taken off the bike before photographing it for last year's post. 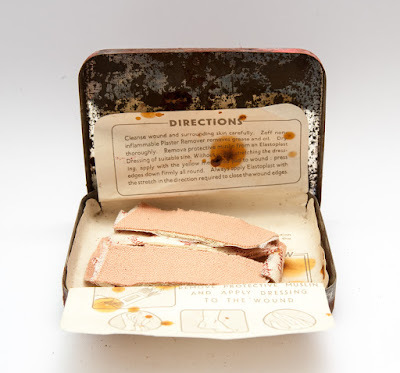 At first look, it was extremely dirty, dishevelled and, dare I say it, decomposed. The contrasting reinforcement on the corners and edges - a nice touch. I couldn't resist stopping the clean-up operation to see what was inside since it was a little on the heavy side for an empty bag. 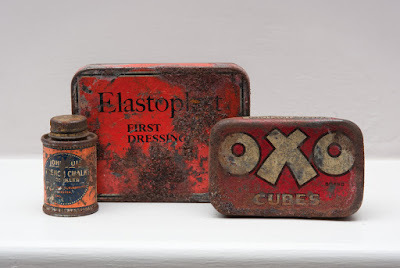 There was the usual collection of cyclist's tools, a few old, rusty tins - OXO, Elastoplast, the latter still with its original sticking plasters and instructions, and John Bull French chalk for sprinkling over puncture repairs after a patch has been glued in place - waterproofs and, wrapped in newspaper, a couple of fixed gear cogs. There was no date on the newspaper but the small piece that wasn't too crumbly to read was the cinema listings and one of the films just showing was Two Weeks With Love with Jane Powell and Ricardo Montalban. A quick look at the IMDB website revealed that the film had been released in 1950. It looks as if the cogs - and probably most of the other bits and pieces - had been in the bag for more than half a century. I don't know about you but findings like that tickle the hell out of me! They're a direct link to the past and, consequently, very evocative. The bag itself looks like an old English-made Carradice, probably from some time around the 1948 date of the Hobbs. Carradice started making their cotton duck saddlebags in 1929 and they're still going strong. So, although it would be easy to pick up a new vintage-looking bag for the bike with nice, green cotton duck and honey-coloured leather straps, it wouldn't be "period correct" for a 1948 machine. And for real enthusiasts, period correct is what it's all about. It's a bit like wanting an original lens hood for your Rigid Summicron rather than a nice new Chinese-made one off Ebay. followed by drying out in a mouldy shed isn't the best way of treating it. Take a look at the pics on this page. It doesn't look much, does it? Grimy, covered in dirt, detritus and cobwebs and fit, so many people would think, only for the bin. But it's amazing how well cotton duck emerges from a good scrub. The bag went into the washing machine last night. I would have liked to have hand-washed it but it was far too dirty for that. I removed it this morning and it looks quite spruce all things considering. An unfortunate casualty, however, was one of the leather straps used to hold the top flap down. The leather was just too crumbly and didn't survive the rough and tumble of the machine. Overall, though, I'm pleased with the way it has come out. I'll find another leather strap from somewhere or might just get by with one. 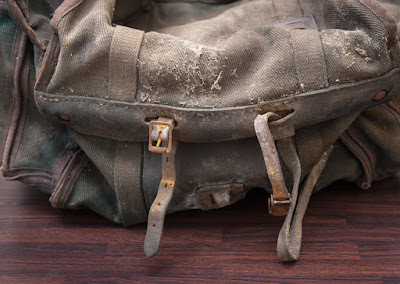 If you check out the pictures I've posted here and you can look beyond the grime, you'll see some nice touches such as the contrasting piping used to reinforce the edges of pockets, the extensive use of good quality leather reinforcements and an abundance of nice, leather straps and metal buckles. No plastic here, for obvious reasons. 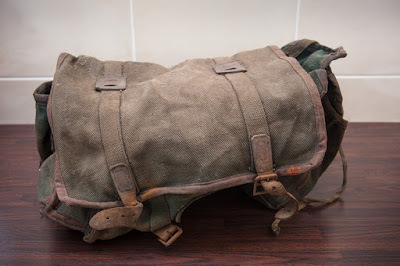 As I type this, the bag is sitting on a dining chair downstairs bulked out with the dogs' towels and paper kitchen towels to help it dry in something approximating the correct shape. Once it's dried, I'll get a bottle of leather conditioner out and copiously coat the leather to help soften it up and nourish it. The leather straps will need some attention and the buckles are a bit rusty so they'll need something - don't know what yet! - to clean them up and stop any further corrosion. Scrunched up cooking foil and a little WD40 for lubrication is a great way of removing rust but it might be a bit finicky on something as small as a buckle. There are a few holes in the cotton duck, whether through wear and tear or a hungry rodent I'm not sure. I'll get some matching thread and darn those just to stop stuff falling out when the bag is back on the Hobbs. 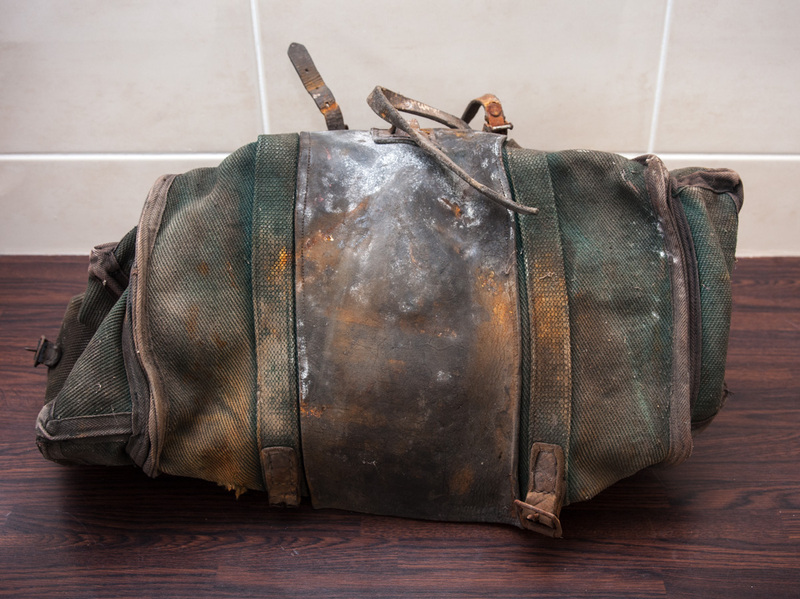 I reckon the bag will end up looking quite presentable and, crucially, entirely in keeping with the patina of the bike. 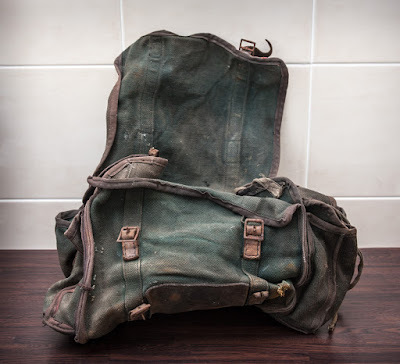 If I were to have the frame repainted to match its appearance when new then it would probably be more fitting to buy a new Carradice bag as the old one would look a right munter then. 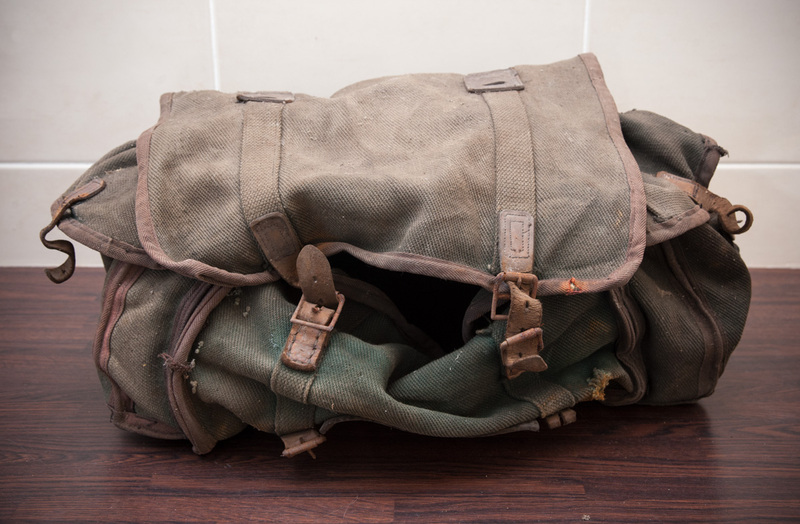 But for a 67-year-old bike with it's original paint, the 1950 saddlebag is perfect. The world of camera collecting may be a bit weird and fastidious but I reckon vintage bike collecting takes some beating in that regard. When I'm putting the bike back together, the aim will be to make sure that as many original parts as possible that were on the bike are reused. 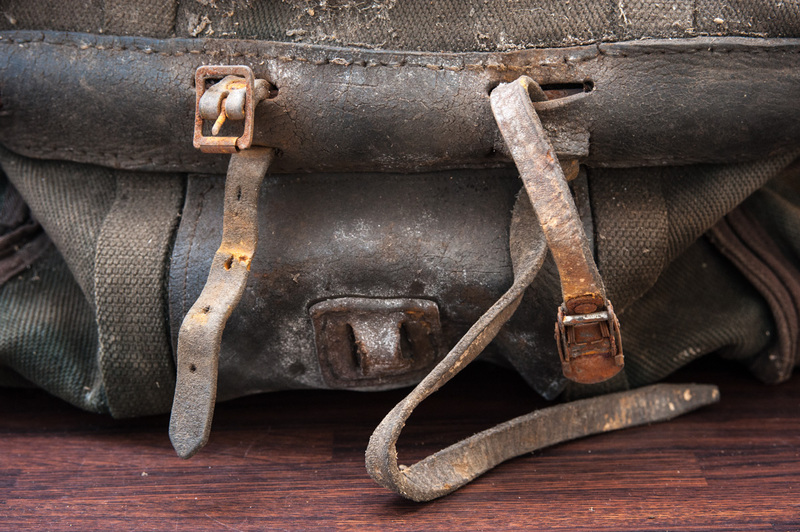 Those that are too worn will be replaced by better condition parts that were available in 1948. The aim is to build up a bike that, although showing its age, is entirely convincing as a machine that was used for a couple of decades and then stored away. I suppose it's like creating a time capsule: every time you look at a sympathetically restored bike, it should transport you right back to the era in which it made its first appearance. With the Hobbs of Barbican, I'm 90% of the way there. I have all the parts I need and it's just a case of having the hubs built into a pair of period rims. After that, it's the matter of an afternoon's work to have it once again fully functional and conjuring up images of a simpler time when there were few cars competing for space and the roads swarmed with scores of club cyclists up and down the country every weekend. I'm totally with you Bruce...I would be thrilled with that bag and to find the contents with evidence that dated them. I bought a Weston light meter last year and it wasn't until I got it home that I saw it had the original sales receipt dated 1958, and with the name and address of the person who bought it. That was a great feeling. However, I couldn't resist using a bit of modern technology (Google Street View) to check out the buyers house! This is why I think the Film VS Digital debate is such a waste of time and energy. I don't really care which has the most dynamic range or the highest resolution. I just want to use traditional photography methods and beautifully designed vintage mechanical cameras. I love the thought that I'm using a camera that someone might have used to take snapshots of their families, holidays or whatever. 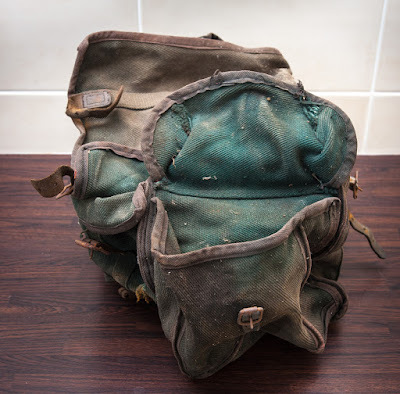 I have a very similar Carradice saddlebag which is about 30 years old and almost good as new ... well just a bit faded but they do last very well. My Brooks B17 saddle is about the same age - I'm hoping it will be properly worn in soon ! My Carradice bag makes quite a good cycling camera bag too; I have a layer of foam in the bottom taken out of a rigid camera case and a few spare bits of foam which fit around the camera as required. Either a Fujifilm GA645Zi or Yashicamat 124G fit in their nicely, If you prefer 35mm then an Oly XA or 35RC fit nicely into the side pockets - or one in each side pocket to allow a choice of film stock. I think we're probably a dying breed. Most people, it seems to me, couldn't care less about the provenance of a product, the craftsmen who made it or the direct link it provides to the past. Their loss, I suppose!